Today we have a double-header: Sharon Long reviews of A Dish Best Served Cold by Rosie Genova, and then an interview with Rosie. A Dish Best Served Cold by Rosie Genova was published as a paperback from Penguin Random House in August 2015. 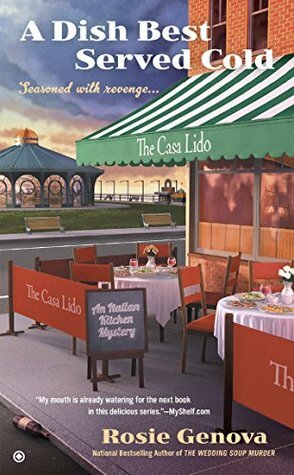 This is the third book in The Italian Mystery Kitchen series and is a cozy mystery with romantic elements. The protagonist Victoria "Vic" has two jobs - one at Casa Lido, her family's Italian restaurant, and the other as a mystery writer. While in the kitchen prepping vegetables, Pete the town's homeless drunken bums shows up for a hand out and hopefully some vino. As Vic is giving him food, he mentions he has stories to tell. A few days later everyone is busy preparing for the restaurant's 70th anniversary with a huge outdoor party. As the guests are beginning to enjoy dinner, the forecasted hurricane blows in forcing everyone inside. During dessert, Vic's brother, who is a policeman, tells them that Pete was found dead at the carousel house on the boardwalk. Naturally Vic's curiosity gets the best of her. She and her sleuthing sister-in-law partner begin to investigate. The trail leads them to suspects around the town but also to a relative who mysteriously disappeared back in Italy. The character of Vic reminded me of a younger Jessica Fletcher in the Murder She Wrote series. The book combines mystery with Italian heritage and includes a few Italian recipes at the end. I enjoyed the various ethnic characters in the story, which takes place mostly in New Jersey near the boardwalk. The plot moves from present day to the Italian mob in their heyday in Atlantic City. This is an enjoyable, fast summertime read, which takes you to the jersey shore and beyond. In the second book in the series, The Wedding Soup Murder, there is a back story from the 1950s that ends up having a bearing on the murder that transpires in that book. My research for that got me fascinated with life at the Jersey shore in the 1950s. For the current book, A Dish Best Served Cold, I developed that idea for the cold case that serves as the backdrop for the story. I also knew I wanted to include contemporary elements like the historic carousel (inspired by the one in Asbury Park, NJ) and a hurricane that affects the residents of Vic’s town—though not on the scale of Hurricane Sandy. A reader of mine told me a story about her mom, who has Alzheimer’s. Her mom took a real liking to my first Kitchen Mystery, Murder and Marinara. She reads it over and over again, not always remembering that she’s read it before. But she loves it each time. It’s the highest compliment I’ve received on my work! Do you share any traits with your protagonist? Which traits? I generally draft the Kitchen Mysteries over six months or so. I’ve worked with the same editor for all three books, and now have a better sense of her revision suggestions. Revisions on A Dish Best Served Cold, including the copyediting round, probably took 10-12 hours overall. Being an English teacher definitely helps! Since one of the subplots concerns a decades old murder that happened in Atlantic City, I did lots of reading about AC in the days after World War II. Its heyday had already passed, but I learned about an Italian-American neighborhood there called Ducktown, because the immigrants raised birds in the early days. Because Vic is looking into her family background, I also spent time looking at ancestry websites to get a sense of the kind of research she would be doing. And for all three books, I’ve called upon the expertise of one of my neighbors, a retired police detective, to help me with questions regarding law enforcement procedures. Deborah, thanks so much for having me today! It was so great after reading this book, to see this interview with Rosie. Her comments shed some light on the story. Thank you Rosie! Thank YOU, Sharon, for your kind words and for visiting with us today!